bl.uk > Online Gallery Home	> Online exhibitions	> Asia, Pacific and Africa Collections	> Sawen-Droog, from the N[orth]. This uncoloured aquatint is taken from plate 12 of Captain Alexander Allan's 'Views in the Mysore Country'. Savandurga is situated among the forests of the Magadi Hills. At 4050 feet (1207 metres) high these glowering granite rocks are visible from nearby Bangalore. Savandurga consists of two cliffs separated by a deep valley. The dark rock on the left is covered with vegetation and called Karigudda, or Black Rock; the paler rock on the right is completely barren and called Billigudda, or White Rock. The fort on top was the strongest and most impregnable of Tipu's hill-forts. Allan described the place as "a fortress constructed on a stupendous rock". 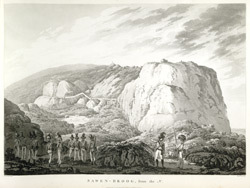 He stated: "On hearing of the capture of Sawen-Droog, the inhabitants of Seringapatam did not hesitate to prophecy that their capital was gone." The fort was taken on 21 December 1791 by a British detachment commanded by Lt Col Stuart, their success due to their intrepid ascent of the perpendicular cliffs.